Howard Marks is a renounced value investor and co-Founder of Oaktree Capital Management, USA. He has a net worth of $1.95 billion as per latest Forbes estimates. To get things clear to readers, he is considered as a guru by the one and only Warren Buffet. 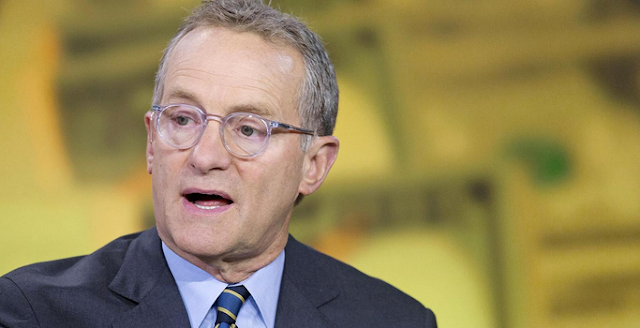 "The most important thing" is his famous book on value investing. published by Columbia Business School. Recently he visited India for the first time and shared his thoughts regarding value investing and his perspective about Indian economy. The greatest market mistakes are driven by emotion - either too much greed or too much fear, too much optimism, too much pessimism and not by analytical mistakes. Groups of people are subject to mass hysteria and so at the extremes, my experience of almost 50 years tells me that when things are going well, people get too excited and want to buy too much at prices that are too high and when things are going badly, people get too depressed and want to sell too much at prices that are too low and that does not mean that you can make money by buying every day the market goes down and by selling every day the market goes up. It merely means that you should be alert to the errors of the crowd especially at the extremes. I think the world will look less happy than it did in the 1990's but more happy than it looks today. I think that in the 1990's things went better, the fundamentals were better and people were really happy, it was a period of good feeling. Now the fundamentals are going less well. I believe that people to some extent exaggerate or over-exaggerate the deterioration of the fundamentals and today they are rather gloomy. So I think that five years from now, we will probably have adjusted to life in a lower growth world and hopefully there will be less gloom. In the meantime, I think the gloom will have reached a higher level. We will have great times to buy and hopefully we will be sitting on some substantial profits by that time. My impression is still very positive on India. I like the country, I like the people and I had a wonderful time here. This country has great resources and has the potential to be a winner. It needs to organise and mobilise, it needs a good government. Move forward but with caution. Moving forward with caution does not mean one stops investing. “It merely means that we are investing, and we are fully invested but everything we are buying is selected with caution and we consider ourselves a cautious firm. We are protected from risk because of our caution approach and we are able to participate when the markets do surprise - this is attributable to the mantra. 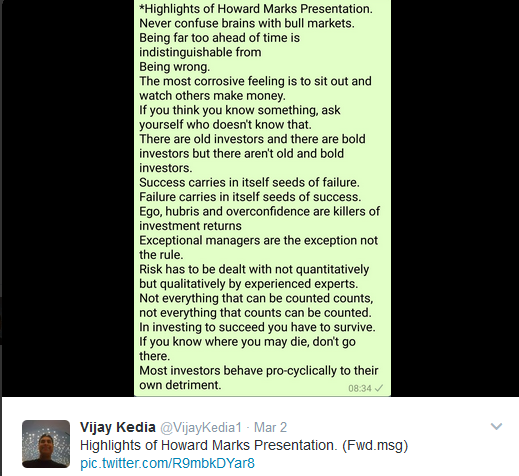 Vijay Kedia tweeted a forward message which contains the important points he discussed with top Indian investors as below. Nice article. Loved the WA message too from Mr Kedia.